Nepal Food Security Monitoring System (NeKSAP) released version 1.0 of the assessment report on 21 August 2017. 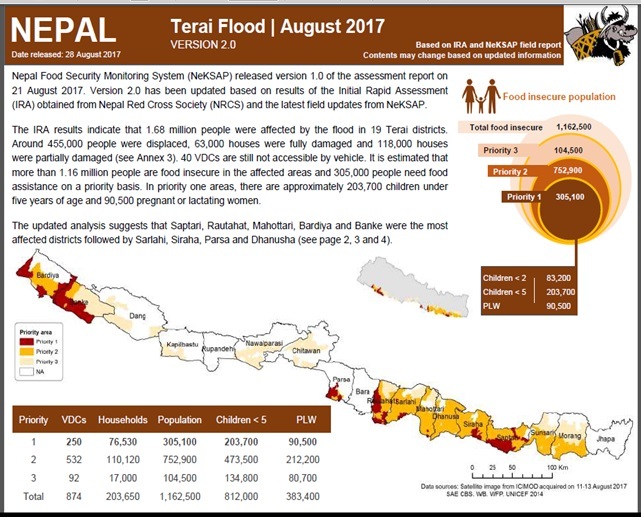 Version 2.0 has been updated based on results of the Initial Rapid Assessment (IRA) obtained from Nepal Red Cross Society (NRCS) and the latest field updates from NeKSAP. The IRA results indicate that 1.68 million people were affected by the flood in 19 Terai districts. Around 455,000 people were displaced, 63,000 houses were fully damaged and 118,000 houses were partially damaged. 40 VDCs are still not accessible by vehicle. It is estimated that more than 1.16 million people are food insecure in the affected areas and 305,000 people need food assistance on a priority basis. In priority one areas, there are approximately 203,700 children under five years of age and 90,500 pregnant or lactating women. Saptari, Rautahat, Mahottari, Bardiya and Banke were the most affected districts followed by Sarlahi, Siraha, Parsa and Dhanusha.